Quilting frames are great additions for any serious crafters who enjoy hand quilting or who need to speed up a machine quilting project. They are structures that hold the parts of the quilt: the batting, the quilt top, and the backing. The frame is basically like an extra pair of hands, helping you to keep the quilt taut during work. You might also be interested in our article about the best quilting machine. Without a hoop or a frame, hand quilting can be very difficult. Frames can keep the quilt taut as you work and they will remove the frustration caused by bunching and they can also help you obtain a more professional look. Because the frames firmly hold all three layers in place, you won’t have to constantly move and turn the quilt. As a consequence, you can finish up difficult projects more quickly. Most floor and lap frames are usually inexpensive. Even some of the larger machine frames don’t have huge costs and can be afforded by most quilters. The assistance and convenience provided by these frames can make it so it’s definitely worth it to invest in one. It’s possible to make your own quilting frame, as a DIY project using inexpensive materials that can be bought from local home stores. But if you don’t want to bother, buying one can be more convenient as these are mostly low-cost products. As you can see, there are lots of reasons why owning a quilting frame can be a great companion to your sewing machine. Whether you use it for hand stitching or want to take machine quilting to the next level, it’s fully recommended to choose a high-quality model. In this article, you can find the most cost-effective options currently available on the market for quilting frames. Some of them are pretty basic while others can be more complex but they all have one thing in common. They’ve been selected after a rigorous process as all of their features have been carefully analyzed and they’ve been deemed worthy of an investment. Without further introductions, check them out for yourself. If you are a fan of quilting the old fashioned way, the Dritz Quilters Floor Frame is an excellent solution. It’s incredibly easy to assemble and use and it does a good job at holding the batting and fabrics in place while you work. At this price, you will have a hard time finding a better quilting frame than this one. One of the greatest aspects of this frame is the weight which is surprisingly low. At only 9.6 pounds, this one can be easily shifted from a position to another. The assembling process for this quilting frame is very straightforward and shouldn’t take more than a few minutes. The same can be said when it’s time to take it apart. After you disassemble it, you can store it away in a closet or in a box without too much hassle as it becomes so compact. It can squeeze right into the tightest spaces. In case you prefer working with a smaller hoop, this frame can be a game changer for hand quilting. Thanks to the larger space, you can complete quilts at a faster speed. You don’t have to constantly adjust the hoop for a new area and the fewer chances for mistakes represents another great benefit of working in large areas at one time. The frame includes four clams which are used for adjusting the tension to your liking. Many other frames don’t offer this and it can be a very useful option to have. The height of the frame is adjustable between 29” and 35” so that it doesn’t matter what height you have as you can comfortably quilt from any chair. Whether you’re an expert at hand quilting or you’re just getting started, the Dritz Quilters Floor Frame is highly recommended. 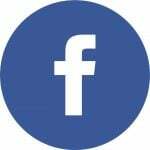 It’s a great product in all regards and considering how easy and comfortable it is to use, it represents a valuable investment at this price. The Start-Right EZ3 from Grace Frame is a premium quilting frame boasting a top-of-the-line 3-rail system allowing you to quilt without the problem of basting. It has a tiltable work area with four different angles to conveniently let you work in the most comfortable way and it also folds up to save space when it’s stored. What’s great about this quilting frame is that each layer of fabric is rolled on its own rail. All of them come together on a so-called “take-up” rail. Handling your fabric and tension without basting is easy due to the three sturdy aluminum rails and thanks to the precision ratchets. For superior tension control, each of the main rails is equipped with a 30 tooth ratchet. This model can be set up in three possible sizes. It doesn’t matter what’s the size of your project, it’s always recommended to put the frame up as large as possible. The working area can be tilted to four different angles to ensure a maximum level of comfort. It’s well-known that sitting in an uncomfortable position can increase the stress in the shoulders as well as in the back during the quilting process. This feature should reduce that stress as it enables you to work in a more comfortable position. In terms of construction, the frame is made from dense Baltic birch plywood which gives it a really premium feel. It also contributes to the lightweight yet sturdy design. Grace installed special Fabri-Fast slots and tubbing to simplify the process of attaching your fabric as you won’t have to rely on tacks, ties, or tape. Considering everything about this quilting frame, it’s safe to say that the Grace Start-Right EZ3 can revolutionize the way you quilt. All its features, including the three-rail and the possibility to make tension adjustments, are very good for this price so if you want to make a valuable investment in an easy-to-use and capable quilting frame, this one is recommended. The Edmunds line of quilting frames has been developed with sturdiness and durability in mind. This model has been inspired by the design of authentic colonial quilting frames with the addition of modern features that add an extra layer of convenience. If you’re looking to purchase an affordable quilting frame, the Quilters Wonder from Edmunds is worth a look. Although it feels very light as it weighs only 5 pounds, this frame is quite stable and can really make wonders for any dedicated quilters. 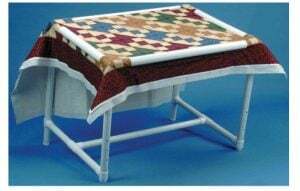 It stands up to 37.5″ high allowing you to comfortably quilt from any chair. The frame can be folded down to 16″ to save a good amount of space when it’s time to store it away. The choice of wood over plastic is a good decision made by Edmunds. 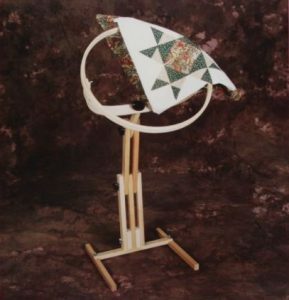 The quilt top is held in a very firm manner in the hoop and the stand seems to work very well. Practicing complex quilt patterns with this model should be a breeze. The hoop tilts and rotates a full 360 degrees on its height adjustable base. Customizing the frame to your liking can be done using the three large knobs enabling you simple access to the important parts of your quilt like the sides and the bottom. If comfort matters to you, then you’ll definitely love the adjustability of this model. Taking into account the abilities and the overall quality of this quilting frame, it’s not very hard to see why this would be a great investment. It can be the perfect gift for someone who’s into quilting or you can purchase it yourself if you have a passion for this art. If this looks like what you’re looking for, you should check it out further because it can be a pleasant surprise. The original size Q-Snap is one of the most popular quilting frames and it’s not difficult to see why. It gives you a large quilting surface while keeping the weight very low. It’s made of high impact polystyrene and has ribbed inner surface clamping caps. It’s a very simple and relatively basic product but it’s simple to use by quilters everywhere and it’s also inexpensive. The frame has an impressive 1,092 Square inches of quilting surface which should offer you plenty of space to work on your craft. Two people can comfortably sit together for a friendly quilting session. Due to the feather-like weight of 10-1/2 pounds, if you also include the suitcase carrying carton, this frame is easy to handle and assemble. It doesn’t require any tools as it’s quick and easy to manipulate and take down for travel or storage. Another interesting fact about its construction is that it’s made in the USA as opposed to many other frames that are made in China and are of poorer quality. Attaching the quilt to the frame is done by using the clips which fasten it onto the frame. The quilt is tightly held between the clips and the frame. The storage box is not very good for storage as it’s made of cardboard but that’s about the only downside I can think of when it comes to this quilting frame. A great product overall, the Q-Snap Floor Frame is amazingly easy to use and it’s small and light enough that moving it around is a breeze. Assembling and disassembling is smooth and quick and the choice of materials is not a bad one considering the quality of the polystyrene. This has great potential and that is why it’s a highly recommended tool for any quilting enthusiasts. 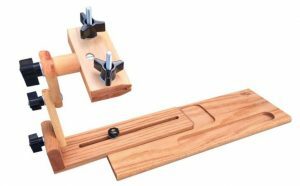 A superb combination of a split rail scroll frame with a stand, the Edmunds Stitcher’s Wonder can help you work more comfortably giving you the ability for hands-free positioning while you’re engaged in your fabric projects. Fairly priced, easy to assemble and made of quality poplar and beech wood, this quilting frame can be an ideal companion for your quilting sessions. 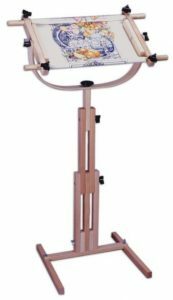 It has an adjustable floor standing scroll frame which allows for complete access to your project by tilting up, down as well as rotating a full 360 degrees. The easy turn knobs enable permit the height adjustment from 16 to 45 inches tall so that you can work in a more comfortable position. Setting up this frame is a pretty straightforward process and to disassemble it, only the loosening of two knobs is required to fold it down for compact storage. The instructions aren’t that well-made and can be a bit difficult to follow especially for those who are just starting to quilt, but you can eventually manage the assembling process on your own with a bit of tinkering. This lightweight frame is made of quality wood and can be adjusted to your preferred height. It performs well and overall, it represents excellent value for the price. The Edmunds Stitchers Wonder is truly wonderful at holding the fabric tightly and it feels reliable when you can adjust it as tight or loose as you need. This is definitely a recommended product for anyone who wants to keep their hands free while quilting and for those who wish to get in the most comfortable position. 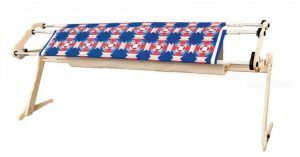 Dritz offers some of the best quilting frames on the market and another model worth taking a look at is the Quilt-N-Go Lap Frame which measures 14 by 14 inches and is highly recommended for the lap method of quilting. Although it may seem awkward to use, it’s actually not very hard to work with even for beginners. As it has an unbeatable price, this frame represents a very attractive offer. This simple snap-together frame is great for group projects as you can use it easily to work more efficiently on smaller blocks of a larger quilt. When you snap down the cover pieces you can truly feel more confident that your quilt stays firmly in place. Even though this one is so inexpensive, it can often be easier to use than other handheld frames you can find on the market. Sturdiness seems to be an important aspect that has received some attention from Dritz. It feels really solid to the touch and a lot of thought went into the construction to be as reliable as possible even during longer-lasting quilting sessions. As this frame is simple to put together or take apart, it can be a great frame for hand quilters who want to take it during travels. It’s definitely recommended for those with more limited space as it doesn’t take up too much room. Although the installing process is simple, make sure you tighten it well because if you do a lot of turning and twisting you can unexpectedly cause it to come apart. For any dedicated quilter, this quilting frame is probably too basic but if you’re a casual fan of this art or want to make an inexpensive gift for a beginner, the Dritz Quilt-N-Go is a good solution. It’s the perfect size to work with on your lap and it seems durable enough to last for a long time. A great quilting frame for the price, the K’s Creation AZF comes with many reliable features to give you a helping hand when quilting. It’s not very difficult to assemble and considering that it’s made in the USA, you can be sure that you will get a quality product. This frame allows for complete open sided stitching and the way it achieves that is thanks to the double jointed pivot arm. This is a unique design that enables stitchers to make the right adjustments to the height of the frame from 4″ to 10″ according to their personal preferences. 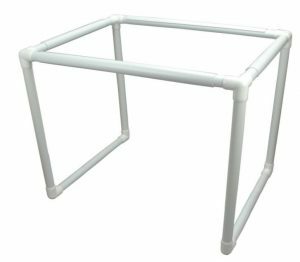 With this product, you can make stretcher bar frames up to 24 inches wide by simply extending the base. This model uses Tri-Knobs which are convenient for turning all connections. As this unit is completely collapsible, there’s no need to take it apart. The frame and the clamp are made of high-quality oak that feels very solid to the touch. A special antique golden oak oil has been applied to give it a shiny finish. It doesn’t come with a scroll but the clamp can hold most brand scroll frames without any problem. What’s great about this frame is that it’s incredibly easy to set up and you can definitely appreciate how it can hold embroidery hoops. Instead of holding the hoop in a hand and stitching with the other you can basically have both hands free and this allows you to use the thread laying tool to make the best cross stitch. If you’ve decided to purchase a quilting frame, this one is a very suitable choice as it gives you lots of adjustable angles and positions. Judging by the sturdy craftsmanship, you shouldn’t be disappointed with the quality of the construction. This will make quilting a breeze so it’s absolutely recommended for beginners and advanced users alike.